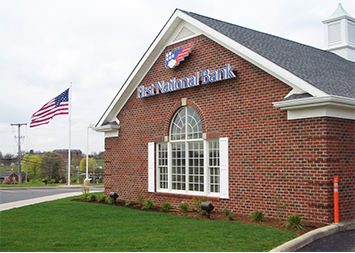 First National Bank in Abingdon, Maryland offers an array of banking services and solutions designed to conveniently serve you. Our dependable team members are ready to assist you with all your banking needs. Visit this branch at 402 Constant Friendship Blvd or give us a call today at 410-569-4019 to learn more about our full range of commercial banking, consumer banking and wealth management solutions. This FNB branch in Abingdon, MD is located at 402 Constant Friendship Blvd and includes a 24-hour ATM for your banking convenience.Our friendly team members are happy to assist you during normal business hours. Or, for after-hours banking, you can use our ATM to make deposits, withdraw cash or check your balance. First National Bank was founded in 1864, and offers a full range of commercial banking, consumer banking and wealth management solutions. If you are coming from near the Maryland Golf & Country Club (1335 E Macphail Rd, Bel Air, MD 21015), follow E Macphail Rd and E Wheel Rd to MD-24 S and continue for 1.8 miles. Take the exit toward Emmorton Rd 924 and then turn right onto Tollgate Rd. Use the left 2 lanes to turn left onto Constant Friendship Blvd. Arrive at First National Bank (402 Constant Friendship Blvd, Abingdon, MD 21009). If you are coming from near Edgewood, MD, take Edgewood Rd to MD-24 N/Emmorton Rd and continue for 1.8 miles. Use the right lane to take the MD-924/I-95 S ramp and then keep left at the fork to continue toward Tollgate Rd. Turn left onto Tollgate Rd and then use the left 2 lanes to turn left onto Constant Friendship Blvd. Arrive at First National Bank (402 Constant Friendship Blvd, Abingdon, MD 21009). If you are coming from near Belcamp, MD, take Collier Ln and Church Creek Rd to MD-543 N/Riverside Pkwy and continue for 1.1 miles. Turn left to merge onto I-95 S and after 3.2 miles take exit 77A-77B for MD-24 N toward Edgewood/Bel Air. Keep right at the fork to continue on Exit 77B, follow signs for MD-924/Emmorton Rd/Tollgate Rd. Turn left onto Tollgate Rd and then use the left 2 lanes to turn left onto Constant Friendship Blvd. Arrive at First National Bank (402 Constant Friendship Blvd, Abingdon, MD 21009). If you are coming from near Pleasant Hills, MD, head north on Pleasant Hills Rd toward Karylou Dr, turn right onto Reckord Rd, and then turn right onto MD-152 S/Mountain Rd. After 1.6 miles turn left onto Singer Rd and continue for another 2.5 miles. At the traffic circle, take the 1st exit onto Tollgate Rd and continue for 0.8 miles to the next traffic circle, where you will continue straight to stay on Tollgate Rd. Turn right onto Constant Friendship Blvd. Arrive at First National Bank (402 Constant Friendship Blvd, Abingdon, MD 21009).